Αποκτήσατε πρόσβαση σε μια ιστοσελίδα της Atradius. Κάνοντας κλικ σε οποιαδήποτε λειτουργία οπουδήποτε σε αυτή την ιστοσελίδα, μας παραχωρείτε αυτομάτως και ρητώς τη συναίνεσή σας για χρήση των cookies με σκοπό την αποθήκευση των πληροφοριών σας, συμπεριλαμβανομένου του πρώτου cookie που δημιουργήθηκε όταν ανοίξατε αυτή την ιστοσελίδα. Για περισσότερες πληροφορίες σχετικά με τη χρήση των cookies ή τον τρόπο απενεργοποίησής τους, μεταβείτε στην σελίδα cookie page. 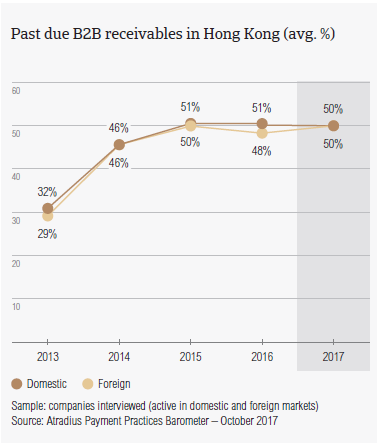 The proportion of domestic and foreign past due B2B invoices in Hong Kong (domestic: 50.0%; foreign: 50.3%) is higher than that recorded at regional level. Hong Kong is forecast to see an acceleration of GDP growth to 3.1% by the end of this year, following an expansion of economic activity by 2% in 2016. Despite this, headwinds, from China and its own overheated property market, could cause growth to slow over the medium term. Confronted with a challenging business environment due to – among others - developments such as Brexit, US protectionism and the slowdown in Asia, 27.5% of suppliers in Hong Kong stated their intention to increase their credit management. 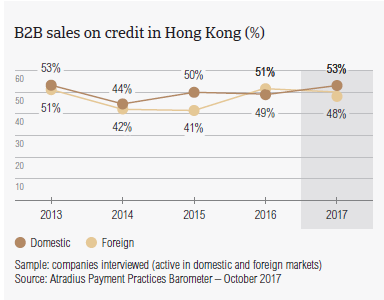 Similarly to what was observed in 2016, respondents in Hong Kong are more open to selling on credit terms to their domestic and foreign B2B customers than most respondents in the Asia Pacific region. With an average of 50.3% of B2B sales on credit terms, the country has not seen a meaningful change compared to 2016 (50.1%). On average, 52.8% of the domestic sales of respondents in Hong Kong were made on credit terms this year. This is an increase from 48.8% in 2016. In contrast, there was a decrease in the average percentage of sales on credit terms to foreign B2B customers. With an average of 47.7%, respondents in Hong Kong seemed slightly more averse to offering credit terms than one year ago (51.4%). In 2017, respondents in the country, like their peers in Asia Pacific, seem more likely to sell on credit terms to their domestic B2B customers than to their foreign B2B customers. This is different than one year ago when a higher percentage of foreign B2B customers purchased on credit. Compared to the regional averages (domestic: 49.5%; foreign: 42.2%), respondents in Hong Kong are more likely to sell on credit terms to both their domestic and foreign B2B customers. In 2017, respondents in Hong Kong reported minor changes in the proportion of past due receivables from both their domestic and foreign B2B customers. On average, 89.6% of respondents in Hong Kong reported late payments from their domestic and foreignB2B customers in 2017. This highlights a minor increase compared to the 2016 percentage of 88.5% and is in line with the percentage reported in Asia Pacific overall (89.2%). On average, 50.0% of domestic and 50.3% of foreign invoices remained unpaid at the due date. The country’s proportion of domestic and foreign past due B2B invoices is higher than that registered at regional level (domestic: 44.6%; foreign: 46.1%). In 2017, there was a small decrease in the percentage of overdue domestic B2B invoices (from 51.0% in 2016) and an increase in respect to the percentage of overdue foreign B2B invoices (from 47.7%). The 2017 the average Days Sales Outstanding (DSO) figure in Hong Kong is 36 days; one day longer than in 2016. Hong Kong’s average DSO figure is four days shorter than the average for Asia Pacific overall. Most respondents in Hong Kong (46.8%) do not expect a change in their average DSO over the next 12 months. 29.8% of respondents expect a slight increase while 19.5% said that they expect a slight decrease over the same time frame. In 2017, suppliers in Hong Kong needed to wait 54 days, five days fewer than in 2016, to turn B2B receivables into cash. However, this is one of the longest invoice to cash turnarounds in Asia Pacific; only shorter than Taiwan (71 days) and India (61 days). In 2017, domestic B2B customers of suppliers in Hong Kong had, on average, 30 days to pay their invoices. This means that the average domestic payment terms have been extended by one day compared to last year. On the other hand, foreign B2B customers of respondents in Hong Kong had shorter payment terms than in 2016. They were given, on average, 31 days to fulfil their payment obligations (2016: 34 days). Small decreases are seen in the average payment delays of both domestic and foreign B2B customers. In 2017, domestic B2B customers in Hong Kong delayed payments, on average, 24 days (vs. 28 days in 2016). Foreign B2B customers of respondents in Hong Kong delayed payments, on average, 22 days (vs. 26 days in 2016). 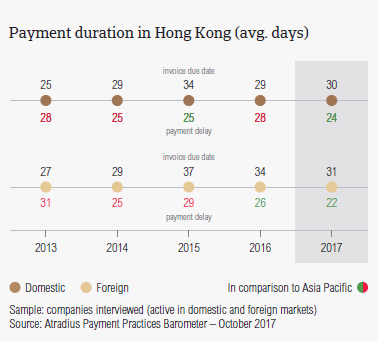 As a result of the changes in payment terms and payment delays, the average payment duration in Hong Kong dropped to 54 days from 59 days in 2016. This is one day shorter than the average payment duration in Asia Pacific overall. Domestic and foreign B2B customers of respondents in Hong Kong seem to delay payments mainly because of insufficient availability of funds. The same payment delay factor was reported by the majority of respondents in Asia Pacific. 47.2% of respondents in Hong Kong said that domestic delays occurred mainly because of insufficient availability of funds. The percentage of respondents stating this reason is much higher than one year ago (32.8%) and higher than thatreported in Asia Pacific overall (43.8%). 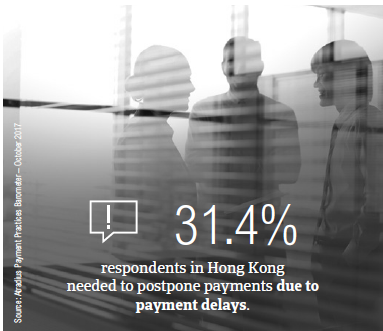 Looking at payment delays by foreign B2B customers, 38.4% of respondents in Hong Kong said that delays occurred mainly because of the inefficiencies of the banking system. While this percentage is slightly above the regional average of 33.3%, there was a marked decrease compared to the percentage of respondents who stated this in 2016 (47.3%). The second main reason for domestic and foreign payment delays was the complexity of the payment procedure, cited by 33.7% of respondents in Hong Kong in respect to their domestic B2B customers and by 34.8% in respect to their foreign B2B customers. When asked about the impact of overdue B2B invoices on their businesses, 22.9% of respondents in Hong Kong said that there has been no significant impact. However, 31.4% of respondents said that they needed to postpone payments to their own suppliers and 30.9% that they needed to take specific measures to correct cash flow. For 13.1% (15.5% at regional level), late payments caused a loss of revenue. Respondents in Hong Kong seem most likely to increase creditworthiness checks and their monitoring of buyers’ credit risk to increase protection against risks arising from Brexit, US protectionism and the slowdown in Asia. 44.6% of respondents in Hong Kong stated that they do not plan on making any changes in their current mix of credit management tools. 27.5% of respondents however said that they plan to protect themselves more in the face of the above-mentioned developments. Similarly to their peers in Asia Pacific, who opted for increasing checks on buyers’ creditworthiness (36.1%) and increasing monitoring of buyers’ credit risk (34.0%), respondents in Hong Kong are also most inclined to increase these two credit management practices (as cited by 30.8% and 30.2% of respondents). Risks stemming from the slowdown in Asia seems to worry the highest percentage of respondents in the country. 38.5% stated that they will increase creditworthiness checks and 33.2% that they will increase monitoring of buyers’ credit risk to ensure business profitability. To manage risks stemming from Brexit, 31.2% of respondents in Hong Kong said that they will increase their use of credit insurance and 29.5% that they will increase monitoring of buyers’ credit risk. US protectionism seems to be the development least likely to spur respondents in Hong Kong to adjust their credit management practices. However, 27.8% said that they would opt for increased monitoring of their buyers’ credit risk and 25.8% that they would increase checks on their buyers’ creditworthiness. The total value of B2B receivables written off as uncollectable in Hong Kong appears to be flattening out; decreasing from 2.5% in 2016 to 2.4% this year. This is above the regional average of 2.1%. Similarly to what was observed in previous surveys, domestic receivables were written off as uncollectable slightly more often than foreign ones (domestic: 1.4%; foreign: 1.0%). Compared to 2016 when 1.3% of domestic and 1.2% of foreign receivables were written off as uncollectable, the percentage of domestic uncollectable receivables increased slightly while the percentage of foreign uncollectable receivables saw a minor decrease. Uncollectable receivables in Hong Kong originated most often from B2B customers in the consumer durables, textiles and electronics sectors. 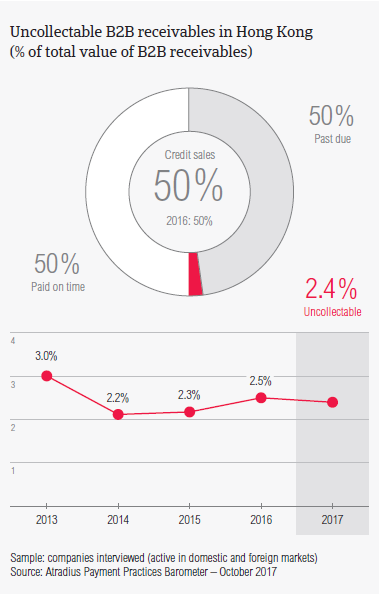 B2B receivables in Hong Kong were uncollectable most frequently because the customer could not be located (42.1%), the customer went bankrupt or out of business (38.8%) and because the debt was too old (29.6%). Looking at the coming 12 months, respondents in Hong Kong expect that the payment behaviour of their B2B customers will deteriorate slightly. Compared to the 31 days average for the country overall, B2B customers in the metals and the machines industries (on average, 52 days and 46 days respectively) enjoyed more lenient payment terms. 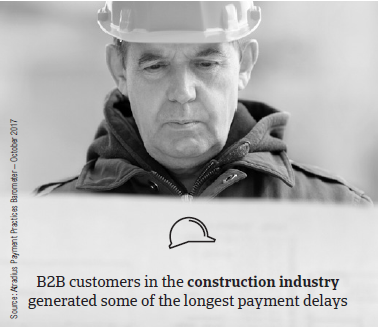 At the other end of the scale, B2B customers in construction materials (25 days) and those in the construction sector (26 days) needed to settle their payments faster. B2B customers of respondents in the construction and consumer durables sectors generated some of the longest delays. They paid, on average, 37 and 29 days late respectively. Similarly to what was stated in the country overall, the main reason for payment delays in the construction and consumer durables industries seems to be insufficient availability of funds. This was cited by 44.0% of respondents in the construction sector and by 53.0% in the consumer durables sector. Respondents in Hong Kong said that their B2B customers in the construction industry also delayed payments because of disputes over the quality of goods and services provided, the complexity of the payment behaviour and the inefficiencies of the banking system (each reason stated by 28.0% of respondents). In the consumer durables sector, the second main reason for payment delays was incorrect information on invoices (cited by 39.0% of respondents). After a minor decrease from 45.0% in 2015 to 44.3% in 2016, the percentage of overdue B2B invoices in Asia Pacific increased again this year to 45.4%. The first hint of spring is in the air leaving this Economic Outlook in a position of cautious optimism. The automotive sector faces decreasing domestic sales due to a decrease in population and a growing share of elderly citizens as well as tax hikes. Οι δηλώσεις που γίνονται στο παρόν παρέχονται αποκλειστικά για γενικούς ενημερωτικούς σκοπούς και δεν πρέπει να γίνεται επίκληση για οποιονδήποτε σκοπό . Ανατρέξτε για τους ισχύοντες όρους στο σώμα του Ασφαλιστηρίου Συμβολαίου ή στο σχετικό συμφωνητικό προϊόντος ή υπηρεσίας. Τίποτα στο παρόν δεν πρέπει να εκληφθεί ότι δημιουργεί κανένα δικαίωμα, υποχρέωση, σύσταση ή ευθύνη εκ μέρους της Atradius , συμπεριλαμβανομένης οποιασδήποτε υποχρέωσης για τη διεξαγωγή due diligence επί των αγοραστών ή για λογαριασμό σας . Αν η Atradius διεξάγει due diligence σε οιονδήποτε αγοραστή, αυτό γίνεται για δικούς της σκοπούς σχετικά με την αξιολόγηση του κινδύνου και όχι προς όφελος του ασφαλισμένου ή οποιουδήποτε άλλου προσώπου . Επιπλέον , σε καμία περίπτωση η Atradius και οι συνδεδεμένες και θυγατρικές εταιρείες μπορούν να καταστούν υπεύθυνες για οποιεσδήποτε άμεσες , έμμεσες , ειδικές, τυχαίες ή αποθετικές ζημίες που απορρέουν από τη χρήση δηλώσεων ή πληροφοριών στο παρόν .